Opening up my mailbox to find indie (literary) books I might never otherwise discover is one of the pleasures of reviewing for IMAGE Journal. 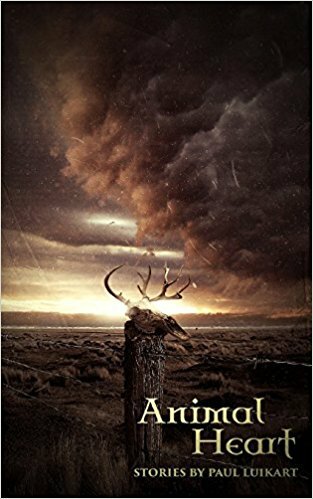 Each month I get to read and ponder a new one for their digest of delights, ImageUpdate, and recently it was Animal Heart, a collection of short stories by Paul Luikart. I think sometimes about whether I regret my own choice to work so many years in nonprofits. Certainly, at times, it has slowed the pace of my writing. But it has also made me think about human beings in all their wildness in a new way. I see the fruits of that in Luikart’s book, for sure. And I hope he writes another one. Here’s the review as it appeared in ImageUpdate. “Why’d you do it, son?” says the Sheriff’s Deputy to the armed robber. “Fun, I guess,” the man says. To which the deputy replies: “You know, they got things like parachute clubs. Hang gliding. Race cars.” The characters in Paul Luikart’s story collection Animal Heart don’t hang-glide—and, for the most part, aren’t actually having much fun. Witness eleven robberies, assaults, and murders/attempted murders; seven broken marriages; eight cheap motels, lonely bars, jails, and other unpleasant places to spend a night; two battle scenes; and a shipwreck. Oh, also—several stories that prominently feature dead or dying animals. In other words, the title seems to imply: Humans at the mercy of our own animal hearts, acting in ways inexplicable to ourselves and others, whether the truck driver abandoned by his partner with a trailer of basketball shoes in Montana, or the several men (all the stories feature male protagonists) baffled by their wives and lovers. The flashes of meaning and goodness, then, are all the more welcome; they glare for brief moments like “a rainbow dipped in vinegar,” one character’s luminous phrase for the light in his jail cell seen through the lens of too much alcohol. The stories of alcoholics in recovery are, in fact, some of the book’s most engaging. A man’s AA sponsor urges him to pray, and the man demurs at first, only to change his mind and have a profound spiritual experience while face-to-face with a deer head mounted on a living room wall. If it sounds odd, it is—and moving. These glimmers, like those in real life, are sometimes just as inexplicable as the violence. The story “A Week at the North Hotel” carries faint echoes of the Holy Week narrative in its day-by-day account of a flophouse, complete with a Friday murder and a day of rest (“On Saturday, nothing happened”), and then a mysterious Sunday culmination. The events of the story feel like an invitation to read again, to ponder what it all points to. The reader suspects, and discovers, more in these memorable stories than the darkness where they began.